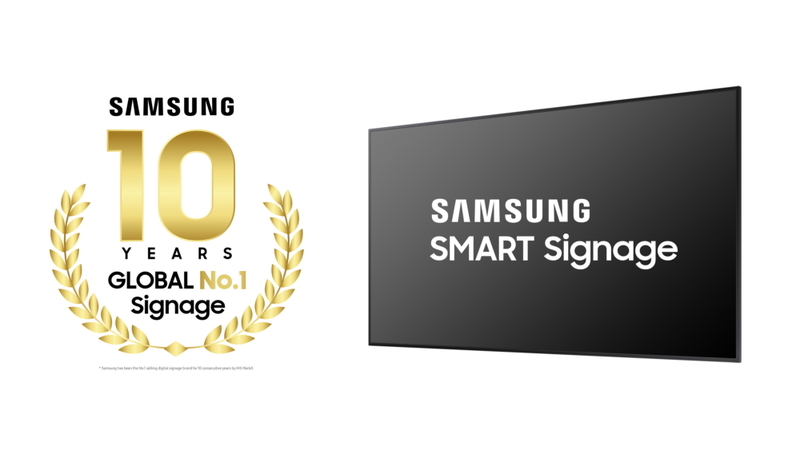 For the 10th consecutive year, Samsung Electronics has maintained its position as the No.1 worldwide leader in digital signage as measured by unit sales. Recently released data from IHS Markit, the leading provider of digital signage market data, identified Samsung as the top selling brand in the industry since 2009. According to the IHS Technology report “Public Displays Market Tracker”, Samsung accounted for 25.8 percent of the global market share for digital signage unit sales in 2018*. Featuring a range of dynamic and versatile displays, the latest additions to Samsung’s SMART Signage portfolio includes several prominent industry award-winning products across various categories. Each delivers tailored solutions for numerous industries and verticals including retail, quick service restaurants, airports, digital out-of-home (DOOH) advertising, corporate, education, entertainment, hospitality and public transportation. These display technologies offer a more powerful visual alternative to standard signage. QLED 8K Signage – Offering the highest resolution in the market with Artificial Intelligence (AI) upscaling technology, QLED 8K signage enhances any image in commercial displays into more vibrant and engaging content to capture the attention of potential customers. Additionally, intelligent AI upscaling allows store owners and advertisers to produce content at a lower cost and resolution and still display in stunning 8K quality. QLED 8K signage was named Winner of the AV News Award in the Digital Signage Innovation of the Year category and Best of Show award at Integrated Systems Europe 2019 given by Installation, an industry publication. Semi-Outdoor OMN/OMN-D Series – Designed with storefront windows in mind, this series delivers consistent visibility, even in direct sunlight. Clean cable organization, easy-to-use software and a durable, energy efficient display make it a great choice for retailers. The OMN-D series is dual-sided allowing businesses to feature content both toward the street and in the store in a single display. The OMN/OMN-D Series was also recognized as a winner of the 2019 Top New Technology (TNT) Award for All-Weather Displays. Full-Outdoor OHN/OHN-D Series – Built with IK10-rated Magic Protection Glass, the OHN Series offers outstanding visibility as well as IP56-rated waterproof and dustproof display for unsurpassed durability. The OHN-D is a double-sided screen, ideal for grabbing the attention of potential customers on a bus shelter or street billboard. QMR/QBR Series – These new 2019 UHD 4K display models feature significant improvements including smaller bezels and a symmetrical design. This series was designed for shopping malls, retail stores and airports and features intelligent UHD upscaling and a non-glare panel for visibility. Samsung Flip – An interactive, 55-inch digital flip chart that drives more productive and efficient collaboration at the workplace, Samsung Flip offers a configurable design, natural writing experience and wheel-based stand. Enabling creative and effective office meetings, Samsung Flip was named winner of the AV News Award Presentation Innovation of the Year and 2019 Top New Technology (TNT) award in the Unified Communication & Collaboration category. For more information about Samsung’s latest SMART Signage lineup, visit: https://displaysolutions.samsung.com. * Note: Consumer TVs, along with Commercial Lite and Hospitality TVs used for signage are excluded.